Dosa are delicious. There is so much you can do with them. These crispy, thin, south Indian pancakes can be topped with whatever you please. From the traditional and most popular masala dosas that are topped with spicy mashed potatoes to more modern versions served with anything from Cheddar and spiced apple to Spanish chorizo. You can really get creative. Here I would like to show you the most difficult bit which is how to make and cook the batter. Dosa making takes some practice and experimentation but once you get it down, you’ll be in dosa heaven. I find them quite addictive and make them for my family weekly. Even if you find you are having trouble, don’t give up and throw away the batter! Cook it as you would thick American pancakes, flipping once or twice and serve with butter or the sauce of your choice. Clumpy batter: If your batter clumps up while you are trying to spread it on the cooking surface, your cooking surface is too hot. Turn it down some. Runny batter: If your batter runs off the sides when you pour it on the cooking surface, you added too much water. Try whisking in some rice flour until you have the correct consistency of double cream. Using the Buffalo Crepe Maker makes it is all a whole lot easier. You can set the temperature of the crepe grill which is great because getting the temperature just right is part of making the perfect dosa. I use broken Basmati rice in my recipe as it makes the dosas even crispier. It is available at most Asian grocers. You could also use any good quality Basmati rice. Note: If using the Buffalo crepe maker, use 250ml of batter per dosa. For smaller crepe pans, 180ml should be about right. Place the rice, lentils and fenugreek seeds in a sieve and rinse well. Then pour into a mixing bowl and soak in water for eight hours or overnight. Using a good blender blend the rice, dhal, fenugreek seeds and sugar with just enough water to cover. You will need to do this in batches. Remember, you are aiming for the consistency of whisked double cream. Blend each batch until creamy smooth. Depending on your blender, this will take between 2–4 minutes per batch. When you rub the batter between your fingers, it should only feel slightly sandy with no big pieces. Cover the blended batter and leave in a warm place for 24 hours to ferment. It will bubble up and smell quite sour. Whisk the salt into the fermented batter and you’re ready to cook. Heat your Buffalo Crepe Maker to 190°C. If using a normal non-stick frying pan, heat it over medium high heat. 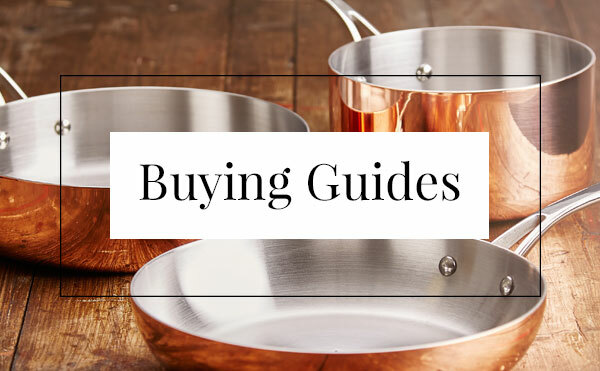 Your pan is ready when a few drops of water splashed on the surface evaporate immediately. Be sure to keep the pan at about this temperature. Using the half onion, spread about ½ teaspoon of oil all over the surface. This should only be a film of oil. No big drops! Pour your batter into the centre of the cooking surface (see note above). Then, using the back of a ladle or a flat bottomed cup, make circular motions from the centre of the batter outwards to spread it thinly over the cooking surface. As the batter cooks, the sides will begin to lift. When this happens, drizzle a little oil around the circumference to make it nice and crispy. After about four minutes, the bottom will be turning a nice toasty brown. Spread a little butter over the top and let it melt for about a minute. You could also add other ingredients such as tomato sauce, cheese, chopped onions, egg, herbs, whatever sounds good, at any time while the dosa is cooking. 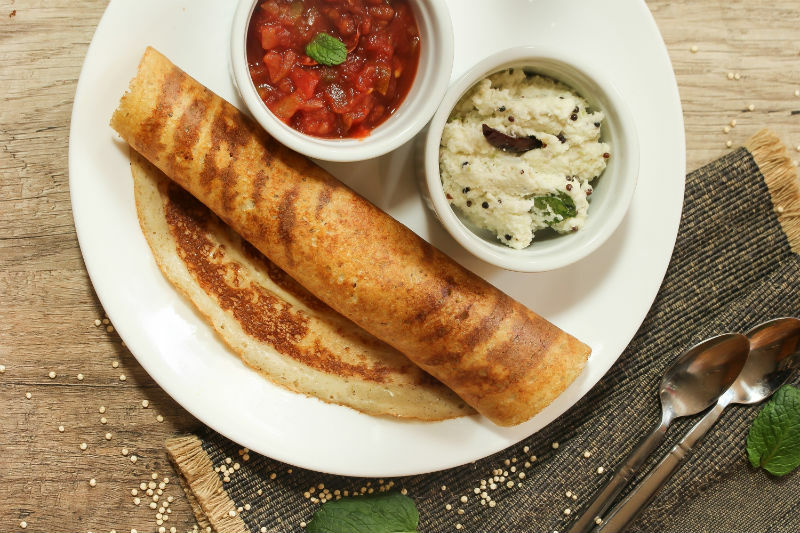 To serve, roll the dosa up with your hands into a tube shape or simply fold it over. Serve immediately on its own or with your favourite chutneys or sauces.